* Would you like Leak/Flood Protection? Looking for an easier to install Countertop Version? Click Here. 5. Housing Wrench, Cold Water Line Adapter, Tubing, Assembly Parts. d. Improves Redox (Antioxidant potential of water). h. Saves Counter Space, Installs under counter. The Pure Effect ULTRA-UC (undercounter / inline system) is a World-Class, Professional-Quality Water Filtration and Revitalization system, manufactured monthly in limited quantities due to the attention to quality and detail that each system demands. Each ULTRA-UC system features our breakthrough Anti-Radiation, Alumina-Free Fluoride Removal and Natural Alkalization Technologies, and is intelligently designed to replicate the condition of clean and nutritious water as found in pristine nature, it facilitates Alkalization, Ion-Exchange, Mineralization, Piezoelectric and Anti-Oxidation activity. PHASE 1: (Chemicals & Sediment) The 1st transparent blue/purple chamber which the water enters features our latest innovation, The SuperBlockTM , a 0.5 Micron Carbon block consisting of not 1, but 2 different types of Catalytic-Grade Activated Carbon, yielding the micro, macro and meso pore diversity that is not found in most carbon block cartridges on the market. This innovation results in our carbon block's ability to capture an unparalleled super wide-range of various chemicals, making this cartridge up-to 15x more effective than regular activated carbon blocks at removing chloramine for example, and over 2x more potent than even some catalytic carbon blocks. It also provides nominal removal of microbial cysts and fine sediment about 100x smaller than the width of human hair, and is infused with the natural KDF55 media to discourage bacterial growth and fouling, which often happens with low-end carbon blocks. PHASE 2: (Fluoride) Next, the water enters the 2nd chamber, where an entire cartridge is dedicated to Fluoride Reduction using our advanced FluorSorb-MAXTM (alumina-free, all-natural) media. It consists of Activated Carbon Bonded with a unique Calcium Substrate which is capable of effectively absorbing the negatively charged fluoride ions. This proprietary fluoride removal technology was developed by us as a result of over 6 years of research and far exceeds the commonly used Activated Alumina media in performance, efficacy and safety. - Natural Zeolite and Calcium release trace Electrolytes & Minerals, in-turn, helping to raise pH (by a factor of 15, apx. from 7.0 to 8.5) to make water more nutritious, naturally alkaline and pH balanced. This system installs under the counter and out of sight. It requires some basic plumbing (connects to your cold water line under the sink using our special adapter, which feeds cold water to the unit). A Dedicated Premium-Quality faucet comes with the system and is installed into the extra port opening of your sink frame (the same port used for the sprayer or soap dispenser). If you do not have an extra port, a small hole 1/2" (min) - 1-3/8" (max) diameter may be drilled in the sink frame (professional recommended if drilling fragile ceramic, granite, etc. sinks). The filter unit body is NSF Certified and manufactured of BPA-Free & Phthalate-Free Precision Machined, High-Strength Plastics. The Filter Faucets are made of purified Lead-Free brass (with your choice of either an elegant Brushed Stainless Steel, Brushed Nickel or Polished Chrome finish) and employ a high-quality long-lasting Ceramic Disc Valve mechanism along with pre-installed tubing for quick and easy installation. The bracket which holds the system together is made of Stainless Steel with a white coated finish, and will not rust over time (as often occurs with regular steel brackets used in inferior systems); Some filter companies even use plastic brackets which easily crack and break. We do not cut corners on quality. By purchasing any of our products, you will also be supporting the US economy, workers and our company. *If you do not have Fluoride in your water supply, you will still benefit from this system, since our unique FluorSorb(tm) media in this system also addresses negatively charged radioisotopes like Plutonium and Uranium, providing a wide-spectrum of radiation filtration, as well as Arsenic and other contaminants, and, because it is a calcium based media, it helps raise alkaline pH naturally. Optional Accessories: 2-Way Output Splitter (To Connect Fridge Line). Leak-Stopper (Detects and Stops Leaks). 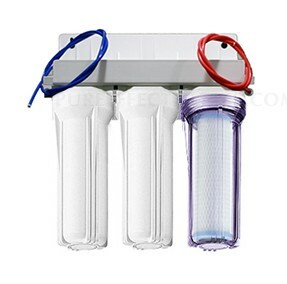 Filter Replacement: Every 6-12 months for consistently superior performance. Filtered Water Flow: Apx. 0.5 Gallon/min.